This year's holiday drink menu at Starbucks Hong Kong includes the new Christmas Panettone Latte, which is basically a fruit cake-flavored latte. A panettone, is the Italian version of a fruit cake. It's not as dense and bread rather than a cake but includes the familiar bits of fruit and association with Christmas. The Starbucks drink version features the a bread and butter flavored syrup mixed with steamed milk and espresso, topped off with whipped cream and a medley of dried fruit. The drink is also being offered in number of Asian countries including Singapore, Malaysia, and China. 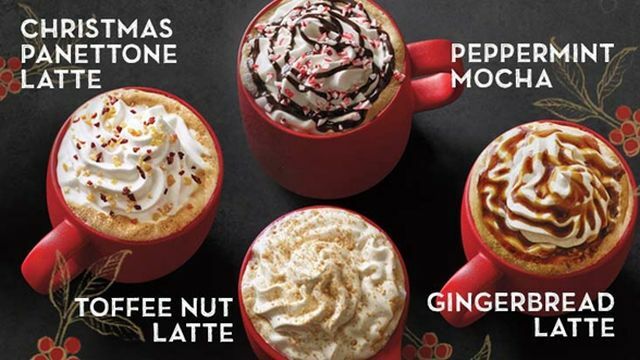 Starbucks Hong Kong's holiday menu also includes more familiar drinks including the Gingerbread Latte, Peppermint Mocha, and Toffee Nut Latte.